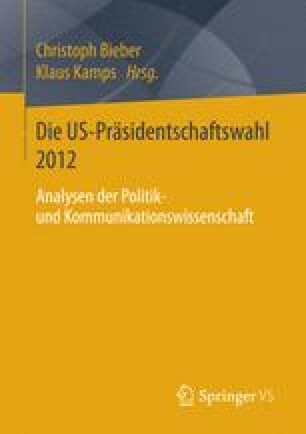 The chapter emphasizes the “supply side polarization” of politics by comparing party policy positions. To develop their analysis, the authors use data from the Comparative Manifesto Project (CMP/MARPOR). While in public perception there are huge differences between both parties (and even more, between the candidates), reviewed data do not separate Democrats and Republicans sharply. While the Republicans stayed relatively stable in their conservative ideological supply, Democrats moved back onto the liberal side for the first time after 2000. Hence, this election was indeed more polarized than the elections before. But, in a more long-term perspective, the 2012 election does not stand out as particularly polarized because the polarization of 2012 is smaller than the peak elections of 1964 and the 1980s. In general, cultural (morality, abortion) and social issues (welfare, healthcare) played a strong role in the 2012 election, revealing areas of distinction between the two parties. Additionally, the chapter discusses the influence of the Tea Party and the Occupy movement on the positions of Democrats and Republicans. Chicago Tribune. (2012). Democrats backpedal and change language on Jerusalem. http://articles.chicagotribune.com/2012-09-05/news/sns-rt-us-usa-campaign-israelbre8841jc-20120905_1_obama-and-jewish-voters-aipac-platform-language. Accessed 5 Sept 2012. Chicago Tribune. (2012) The GOP’s rage platform. http://articles.chicagotribune.com/2012-08-27/news/ct-oped-0827-milbank-20120827_1_platform-writers-platform-committee-shariah-law. Accessed 27 Aug 2012. Franzmann, S. (2010). The change of ideology: How the left–right cleavage transforms into issue competition: An analysis of party systems using party manifesto data. PhD Dissertation, Universitaet Koeln. http://kups.ub.uni-koeln.de/3033/. NY Times. (2012). Party platforms are poles apart in their view of the nation http://www.nytimes.com/2012/09/05/us/politics/how-the-party-platforms-differ.html?_r=0. Accessed 5 Sept 2012. NY Times (2012). Platform’s sharp turn to right has conservatives cheering http://www.nytimes.com/2012/08/29/us/politics/republican-platform-takes-turn-to-right.html. Accessed 29 Aug 2012. Werner, A., Lacewell, O. P., & Andrea, V. (2011). Manifesto Coding Instructions (4th edn). The manifesto project (MARPOR). https://manifesto-project.wzb.eu/information/documents?name=handbook_v4.